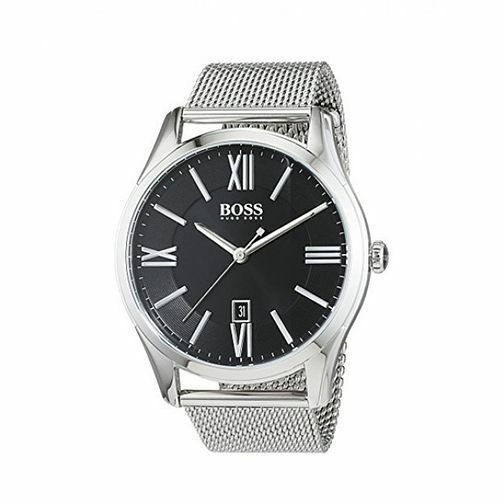 A timepiece for the modern man, introducing the Ambassador watch by Hugo Boss. A 43mm stainless steel case presents a two tier classic black dial with a sleek square date aperature towards the 6-o-clock mark, with silver tone roman numeral and linear markers, and the Boss signature logo towards 12-o-clock. This quartz movement watch is finished with a stainless steel mesh bracelet and boasts water resistancy up to 30 metres. A smart and stylish accessory.